Big wave surfing has been thrust into the mainstream public consciousness in recent years in no small part due to an unassuming small Portuguese fishing town by the name of Nazaré. Visit this popular seaside town in a blustering Atlantic storm-saturated winter though, and you might bear witness some of the most unfathomably fearsome and shockingly enormous behemoths of waves ever recorded. The Guinness World Record for the largest wave ever surfed was set in Nazaré last autumn at 80 feet by Rodrigo Koxa, and the spot has been forever cemented in surfing history, along with its most celebrated big-wave chargers, including British surfer (and part time plumber) Andrew Cotton. If Andrew wasn’t already an infamous name amongst those who follow surfing, or sport in general, his accident last autumn at Nazaré where he was famously catapulted by the wave on an epic wipe out which ultimately broke his back, plastered the media. Andrew Cotton’s name rides hand in hand with Nazaré and with the most illustrious and celebrated big wave surfers in the world. A plethora of imagery over the years of him riding giants constantly filters in each season, in seemingly impossibly sized waves, constantly one upping himself. “In the most critical moments when you’re surfing, especially big waves, you almost go into this state where you are slowing things down...it’s almost like a form of meditation…to get to that state is the ultimate goal”. Andrew’s successes in big-wave surfing have been captivating audiences and fans for years now, each season achieving the seemingly impossible by producing incredible performances that garner world-wide media attention. I wonder what continues to push him on and inspire him, considering his huge successes to date? 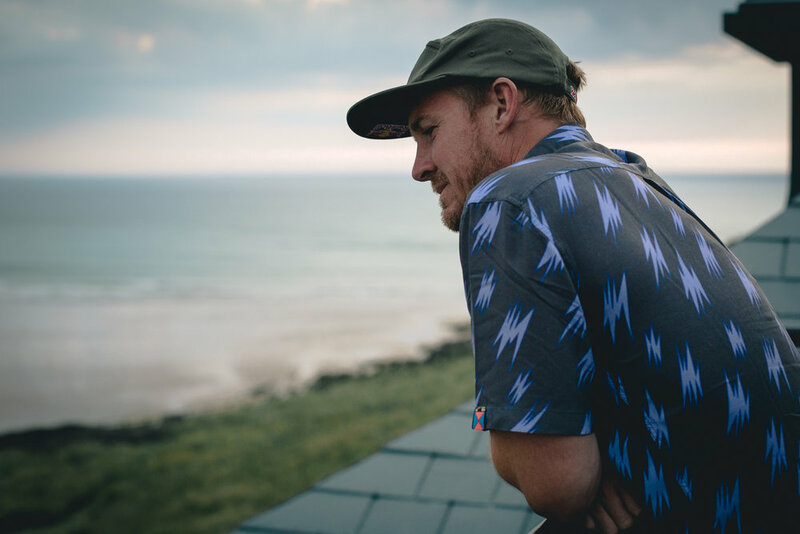 Andrew has cemented the UK has a bonafide producer of big-wave talent, along with the likes of surfers Tom Butler and Tom Lowe. Modestly suggesting that “we’ve been really fortunate in Europe. The UK’s actually a good place to be based. It’s close to (big wave spots) in Ireland, in France, and obviously in Portugal you get giant waves”. No longer just the remit of more traditional big wave spots like Jaws in Hawaii and Mavericks in California, renowned athletes of the likes of Garrett McNamara have been making consistent expeditions to Europe to surf the likes of Nazaré, Belharra in France and Mullaghmore in Ireland. 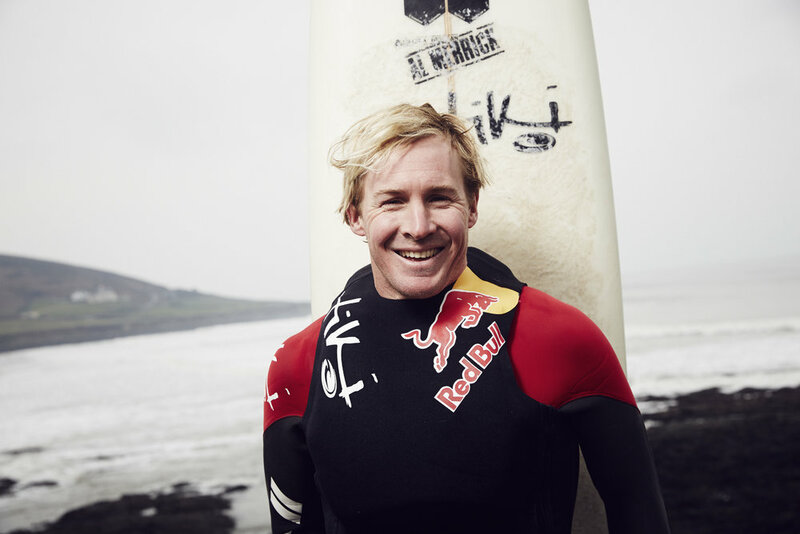 Andrew attributes success in career partly to his friend and foe the awe-inspiring Nazaré. “Nazaré being discovered and being on the map definitely helped my career. Before, I was spending a lot of time in Ireland, and would get 1 or 2 opportunities to surf big waves. It’s about time and experience in the water on the wave, and the more time you can spend in big waves, the better you’re going to become…and Nazaré is big, a lot, from October to March, it enabled me to progress quickly”. I wonder if there has been a record for boards broken in a season for him, and Andrew laughs as he tells me about how on a trip to Madeira, he took 6 boards, and came home with 1. Andrew also suggests that Nazaré, when discussing the breaks he has surfed around the world is “without a doubt” the most fearsome wave he has surfed. “There's no other place that gets as big….and it’s a humbling place too…an amazing place to watch…probably the scariest…”. And his favourite break near home? “My home beach, Croyde, in Devon”. The roster of talent on the WSL tour is well televised and covered across media, big name brands siding as title sponsors and top-name athletes earning well into 6 figures with a successful career. Do big wave surfers get enough support in comparison, I wonder? “I think it’s a tough one really” Andrew begins, “I think surfing as a whole, I don’t think you can categorise it…it has got a lot better…Surfing GB, Surfing England…they’ve put a lot of effort into a lot of coaching, …so I think it is getting better. It’ll be interesting especially now that surfing’s in the Olympics, so whether that’ll change anything…”. Surfing’s inclusion for the first time into the next Olympics in Japan in 2020 has been contentiously discussed and covered since it’s announcement, and with rumours rife that the setting for the competition will be in a wave pool, what this could mean for the future of surfing. “It’s funny, the wave pool…it's great you know, it’s a wave on tap…” Andrew begins, “but at the end of the day, surfing is about being in the ocean, the wave pool is like a different discipline almost. It’ll be interesting to see how it develops, …there’s a wave pool already in Wales, in Bristol, they are looking at doing one in Glasgow, so they are popping up everywhere…it’s going to be an interesting next few years for sure.”. Big wave surfing is producing some exceptional talent, and with Andrew being a key member of the core-pack of long-term chargers, I wonder who he has his eye on as one to watch in the future? “There’s one lad, Lucas Chomba, he’s just started breaking through now. I met him a few year ago, he’s young, about 21. He’s just stated to get on everyone’s radar. He won the Nazaré Challenge…he’s a very talented surfer…”. And any women he thinks are pushing the limits? “There's quite a few really good girls, there's the French Red Bull rider, Justine Dupont, she’s amazing. She not only surfs big waves, she shortboards, longboards, …she is an absolute charger, I have massive respect for her…There’s a couple of girls I’ve been watching…Paige Alms, Bianca Valenti, I’ve been following her for a while”. With the road to recovery being well prepped, Andrew is excepting to be back surfing and heading to Nazaré for this autumn, “100% yeah. I’ll be back, if not before, I’m definitely going to be in Portugal from October”. With key sponsor Red Bull providing ample support, “the best physios to work with, and its knowing you’ve got brand like that behind you, give you confidence I did a couple of course, safety courses, in the states, for Red Bull athletes…you’re part of a bigger thing”, the British athlete is sounding confident and relaxed, coming back from a potentially devastating injury, to looking forward to a new season ahead. I wonder what, if we boil it down to the simplicity of the joy of his profession and life, brings him the greatest happiness about being in the water? “Do you ever get those moments …it’s not about catching a wave, it’s about sitting on your board, outside, out back, it's calm... moments like that, being outside, where you’re by yourself in the ocean…what a cool place to hang out!”.